Photo: The starting line of the North Wilkesboro Speedway. Nestled in the undulating hills of rural North Wilkesboro lies a dormant behemoth. Its vehicular roar shattered the natural ambiance to the cheers of thousands of spectators. 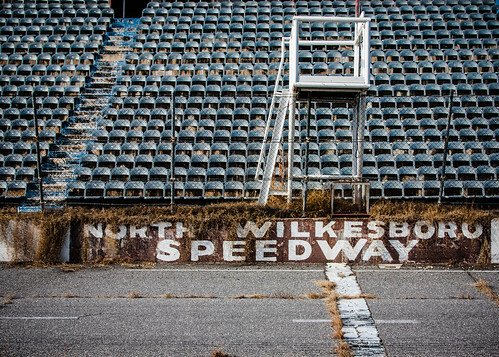 For five decades the North Wilkesboro Speedway offered racing fans a chance to see racing greats up close. During Prohibition moonshiners in the Appalachians modified their vehicles to outrun the authorities. Even after the disastrous social experiment with Prohibition ended, some Americans developed a taste for illicit liquor. Thus a thriving demand for tax-free moonshine continued to spur automobile innovation. Moonshine “runners” continued to push automobiles well past their factory specs well into the 1940’s. The hilly forest countryside of Wilkes County and its geographic proximity to the large urban centers of Charlotte, Greensboro, and Winston-Salem made it an ideal location for runners. The raw power of these heavily modified vehicles attracted the attention of the public whenever they gathered to race. These unregulated races were rife with safety hazards for drivers and spectators alike. The rules were often treated merely as suggestions by participants. Unscrupulous race organizers sometimes made off with the proceeds before the conclusion of the race. Photo: Grass growing through the cracks in the track. William France, Sr., having been burned one too many times by shady race organizers, decided to legitimize these races by the creation of a self-governing body. In the mid-1940s France met with race organizers all over the American south to build his vision. Wilkes County residents Enoch Stanley, Lawson Curry, and Jack and Charlie Combs purchased farmland in 1945 to develop a track. Funding for the project ran short, which resulted in an unintentionally abnormal track design. The .625-mile length of dirt track was not a perfect oval, ran downhill on the front stretch, and uphill on the back. Despite its peculiarities the public came out in droves. Races began in 1946, with official NASCAR races shortly thereafter. Driver Robert “Red” Byron won the final race of the 1949 season at North Wilkesboro Speedway to become the very first NASCAR champion. Over the next few decades NASCAR shifted gears. Engineering feats produced faster vehicles that required larger tracks. With larger venues came increased media exposure, marketing opportunities, and expanded audiences. 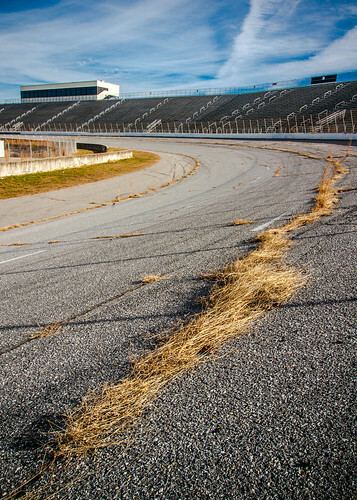 To keep pace North Wilkesboro Speedway CEO Enoch Staley introduced a number of amenities to keep the track relevant. Expanded grandstands, air-conditioned viewing boxes, an electric scoreboard, and other attractions kept race fans coming to the short track. By the 1990s, however, the track’s position in the NASCAR lineup began to fall too far behind the competition. On September 29, 1996 driver Jeff Gordon won the final Winston Cup race to bring an end to NASCAR at the track. Photo: Notice the proximity of the grandstand next to the track. In the period following the final NASCAR race there have been other minor events that have paled in comparison. After protracted disagreements about how to reinvigorate the track and several public gestures that ultimately amounted to nothing, Speedway Motorsports, Inc. has yet to determine the fate of the track. Despite the apparent neglect ardent grassroots support is evident as devoted racing fans try to resurrect the decaying venue. In 2008 fans petitioned North Carolina to place a historical marker signifying its cultural significance. Ongoing efforts by Save the Speedway are resolved to bring awareness to die-hard racing fans connected by social media. Urban exploration, or in this case rural, focuses largely on abandoned buildings. This track is not abandoned. It is in that painful state just before total abandonment or demolition. Reminders of a glorious past still adorn the speedway. A fading Winston Cup mural at the main gate. The rusting electric leaderboard bearing a Tyson sponsorship. The giant sun-scorched orange Union 76 ball. The luxurious viewing boxes are painted with mold. Wild grass has broken through concrete track. A racing fan who has fond memories of the track in its prime would be sorely disappointed. Video: ESPN footage of the final NASCAR race at North Wilkesboro Speedway. NC Markers – M-56 historical marker for the North Wilkesboro Speedway. Racing Reference – NASCAR race results for the track. 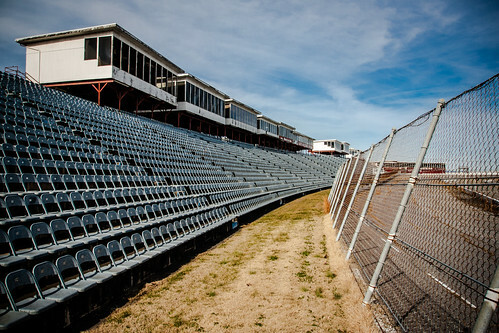 Save the Speedway – An effort to revitalize the North Wilkesboro Speedway. YouTube – ESPN coverage of Jeff Gordon winning the final NASCAR race at North Wilkesboro Speedway. Wikipedia – Entry for the North Wilkesboro Speedway. Wilkes Journal-Patriot – 2012 article on the effort to revive the sparsely used track. Interesting site, looking forward to more! Nice! I was in North Wilkesboro 3 times for work in the last 2 years but had very little time to explore. I wish I had known about this. Thanks for sharing. I love this site! I was wondering if this place is easily accessible? I really want to go to take pictures for my photography website I am currently creating. Thanks!